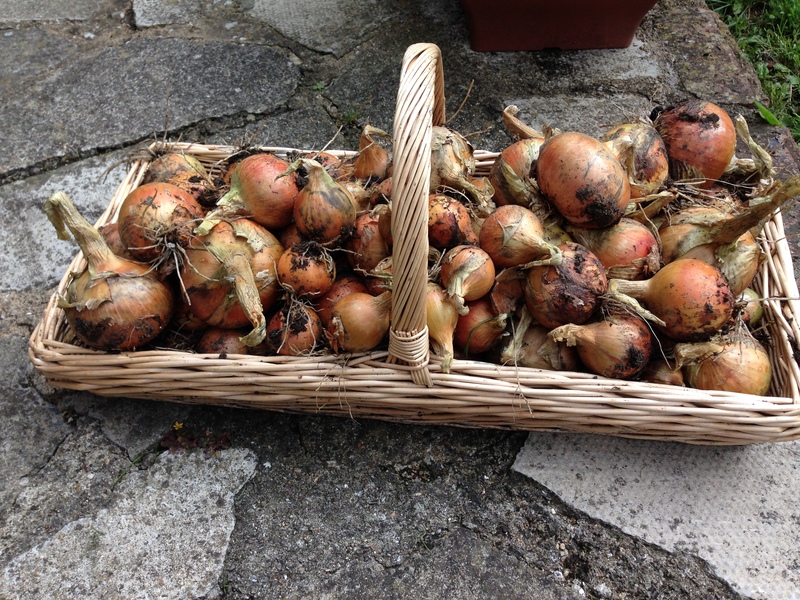 Wednesday 3rd September 2014 – Onions are all up, and some rather large potatoes. George is back to school today, and Emily tomorrow, but as they’re old enough and sensible enough (most of the time anyway) I can leave them at home and pop to the allotment. So that is exactly what I did this morning for about and hour and a half. I made up a box of goodies for my friend Clair who went out of her way to get me loads of manure, so as a “Thank you for some great poo”, I’ve made up a box of various bits from my plot and I’ll take it round to her later. I also dug up all my Onions. I’ve got loads to last us for quite a while, so that’s great news. Most of them have done really well, just the odd small one so I’m very pleased with them. When I got home I weighed some of the largest ones to see how heavy they are, and my largest is 8.1 oz. This I’m rather proud of, lots were around the 6 – 7 oz mark, so good sized ones this year. A rather good sized onion, even if I may say so myself. I also pulled some more Rhubarb, which I’ll see if there are any takers at ringing tonight. I expect there will be, and then finally some more Potatoes. Which were all, what I would class as normal sized ones, until I dug up a rogue plant!! I won’t tell you what I said, but there may have a bit of a naughty word in the sentence. But I’m sure you’ll understand when I tell you that my 2nd heaviest potato today weighed 1lb 9 oz and the heaviest weighed 1lb 9.4 oz!! 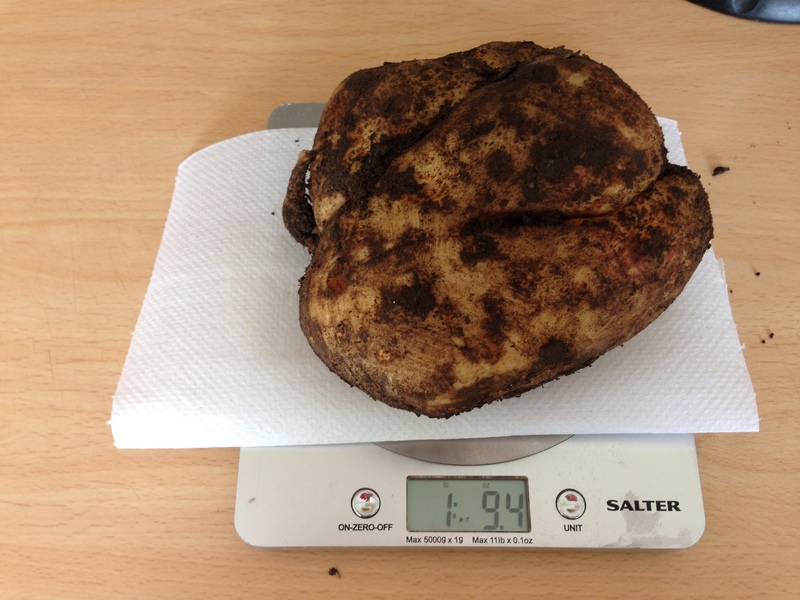 So that’s my heaviest potato ever, as last year I dug up. Last year I had one that weighed 1lb 7.8 oz. If I manage to dig up any that are heavier, I’ll let you know. Now I need to find somewhere to put all my Onions to dry for a month, before I put them in string bags. The greenhouse is rather full still, so I expect I’ll find space in one of my sheds. As long as it’s a frost free place they’ll be fine. Now don’t cry, they’re only onions. Oh and I have a new phone, as mine had a melt down, so I can put pictures up for you to see. This entry was posted in Uncategorized and tagged claire's allotment, onion, potatoes, rhubarb. Bookmark the permalink. 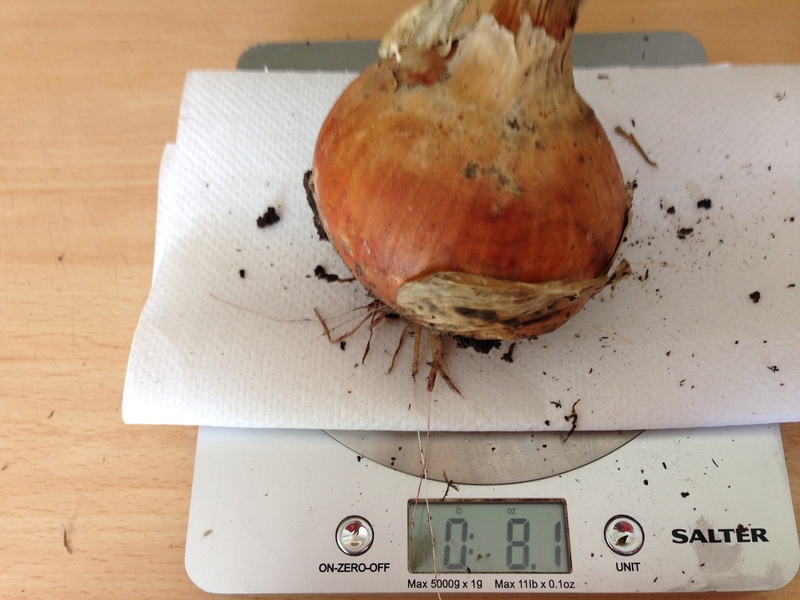 13 Responses to Wednesday 3rd September 2014 – Onions are all up, and some rather large potatoes. In fact it makes too much mash for us 4, so what ever is left I have to fry for lunch the following day. What a shame that is. I’m going to have to get my potato sacks out of the shed and start to fill them up. I’ve still got loads more potatoes to dig up, I wonder what I’ll find. I can’t WAIT until we can start growing stuff on our new allotment (we’ve got to dig it first, after clearing the brambles). Lots of onions to make onion marmalade are on my list 🙂 How long do they last if you dry them and string bag them? Good luck with the brambles, make sure you have a good pair of gloves. If you can burn them, it does help to get rid of them. Start planning now for next year. Start with a few bits, and each year add more and more. As for the onions, I’ll dry them for about a month in the shed, then sack them up. They should stay ok for up to 6 months. Make sure that they don’t get frost on them, otherwise this will make them go bad, and make sure they’re thoroughly dried before packing them in the sacks. If there is a damp one, then it will make the others round them go bad. If you shake the sack every week, then they should be ok. I’m hoping that what I’ve grown will last us til Christmas, I think last year I made it to February time before I had to go any buy some. Thanks for the advice, that’s brilliant. We’ve managed to clear all of the brambles now, and Dad is having mega fun burning them. There are four of us working the allotment, and each of us wants to grow a couple of different things, so I think it’s going to work out quite well. It’s all pretty exciting! Very nice, Claire!! My onions went very well this year, also! I am thinking for more onions next year. And as we say in Greece, “have a nice winter”!! Irene E. from Pireaus, Greece. Lovely to hear from you again. Sounds like you had a great year. I never plant enough onions, but then we do go through a fair amount of them. Hopefully they’ll last me until Christmas. Amazing potato! And great that you did so well with your onions. Mine didn’t do terribly well. My onions started very slow, but then once the sun started to shine they really got going. I’m also sure that the seaweed fertiliser has something to do with it. Wow – what a potato! And it looks on the pic like a chicken from the bbq. Nice to see that some crops are successful – my potatoes didn’t really grow this year: Too hot, then too cold and the slugs ate the whole foliage …. I’m looking forward to 2015. Yes it does, doesn’t it!! I dug up some more today, many of which were over 1lb in weight. I’m not sure what I’ve done to them. Maybe I have radio active soil? I think they’re Apache, so maybe give them a go next year.